Doesn't matter if you're a fan of M. Night Shyamalan, he's consistent and he's back with a horror. This past week I was finally able to check out The Visit. I wanted to see this film for a while but I wanted to wait for the perfect opportunity. I'm not a fan of going to a crowded movie theater. People can be loud and rude, and it definitely takes a way from the film. With that being stated I'd like to review this film I've been looking forward to see for months! The Visit follows two young siblings Becca, an aspiring smarty-pants filmmaker and Tyler, an aspiring rapper who isn't afraid to tell people when to "swerve". The two are meeting their grandparents for the first time. Their mother had been estranged from her parents since leaving home with her boyfriend at the time who is also Becca and Tyler's father. Eventually, the father decides to leave once he follows in love with someone else in Starbucks. The two siblings watched their mother suffer enough and decide that she needs break. The two agree to meet their grandparents for the first time while their mom takes a cruise vacation with her boyfriend. Their mom is skeptically at first but she agrees to let her children go. Upon arriving at their grandparents everything is going pretty well. The grandparents seem loving, supportive, helpful and definitely want to feed them well! The only rule that the grandparents have is that bed is at 9:30 and because of that they are not allowed to leave their room after that. That sounds pretty normal! That's what majority of grandparents want! Unfortunately things do not last normal for much longer, Tyler begins to notice there is something up with his grandparents, something that goes beyond being senile. It takes a bit of time for Becca to come to terms with this, she tries to be understanding and makes up excuses. In the beginning, Becca and Tyler witness some very peculiar sights. As time goes on their Nana and Pop Pop's behavior becomes even more erratic and even scary! Poor Becca and Tyler they wonder if they'll ever get home. I will stop right there to avoid spoilers! 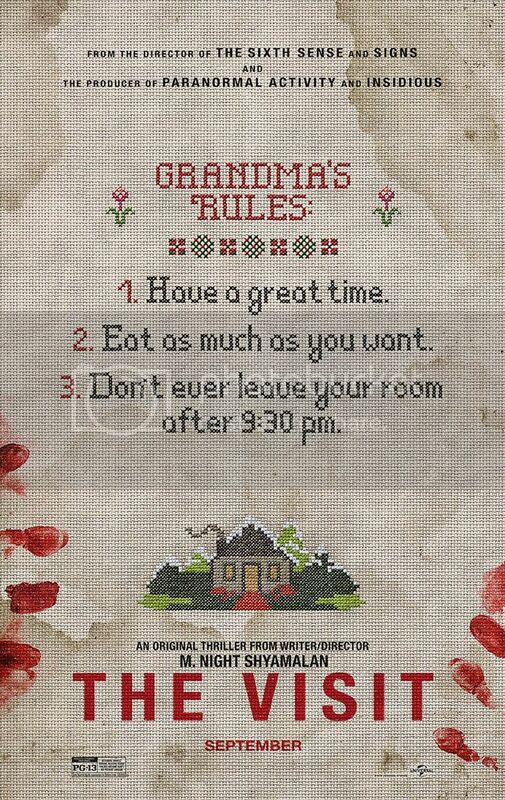 The Visit is a slow burn horror film, so if you're not a fan of that perhaps you should go to hell. Just kidding! If you aren't a fan of that, you may not be too fond of this one. However, if you enjoy slow burn, suspenseful horror you may find this film to be very entertaining and enjoyable. Although, I was just saying that found footage is dead and that because of The Gallows, The Visit isn't trying to have a gimmick like that terrible film. Becca is an aspiring filmmaker and she's making a documentary about her and Tyler's reunion with her grandparents. Therefore it makes total since that she has a camera rolling in the first place. There are certain scenes that doesn't make sense why she's still filming but I will let that one slide! As far as it goes with the characters, these characters were amazing and the actors did an amazing job with their role. This film did a great job with showing how important characters with personality is. I absolutely adored how there was a mix of horror and comedy together. 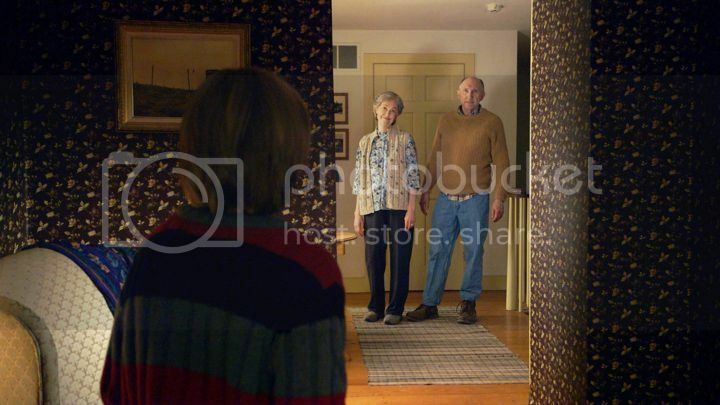 In general, old people can seem really spooky towards kids and I definitely felt like Mr. Shyamalan did a great job causing that effect throughout the film. I can tell that he was having an awesome time trying to keep the viewer off balance. 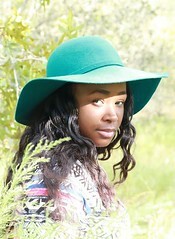 Overall, I recommend The Visit. It's not a perfect film but it is fun and as the viewer you may laugh out loud or gasp. 3½ out 5 queen skulls! Still not sure if you want to check out THE VISIT? Check out the trailer!